There’s no point in the Samsung Galaxy Tab having a camera unless it has a place to store pictures. That’s the Gallery app, which you can use to view, manage, and manipulate the images you take using the Galaxy Tab’s cameras. Further, you can import other images into the Tab, including photos stored on your computer or found on the Internet. Some people hang their pictures on the wall. Some put pictures on a piano or maybe on a mantle. In the digital realm, pictures are stored electronically, compressed and squeezed into a series of ones and zeroes that mean nothing unless you have an app that lets you view those images. On the Galaxy Tab, that app is the Gallery. Start the Gallery app by choosing its icon from the Apps Menu, or you might find a Gallery app shortcut icon on the Home screen. When the Gallery app opens, you see your visual media (pictures and videos) organized into piles, or albums. The number and variety of albums depend on how you synchronize your Tab with your computer, which apps you use for collecting media, or which photo-sharing services you use on the Internet, such as Picasa. Touch an album (pile) to open it and view the pictures or videos it contains. The Camera album contains video you’ve shot using the Tab. The Download album contains images downloaded from the Internet. 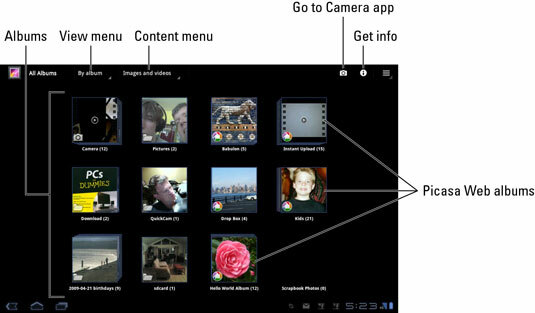 Albums labeled with the Picasa icon have been synchronized between Picasa web on the Internet and your Galaxy Tab. Other albums in the Gallery represent images synchronized between the Galaxy Tab and your computer. Various apps may also create their own albums in the Gallery app. 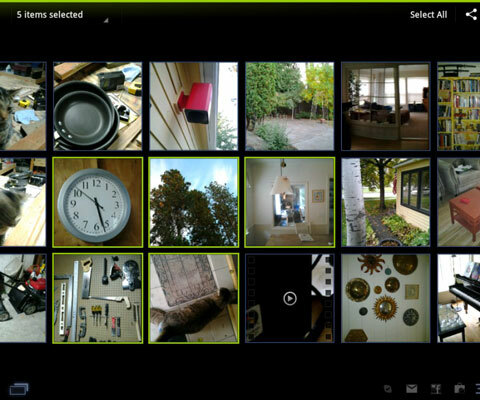 The View menu allows you to control how the images and videos are displayed in the gallery. You can use the Content menu to see pictures, videos, or both displayed in the gallery.